Question: What is Amazon EC2? Full form of Amazon EC2 is Amazon Elastic Compute Cloud. Amazon EC2 is a web service that provides secure, resizable compute capacity in the cloud. You can use EC2 to launch as many as virtual servers as you need, and configure security and networking and manage storage. EC2 enables you to scale up resource as per your requirements. Question: What are features of Amazon EC2? Preconfigured templates for your instances. Question: What is Full form of Amazon ECS? Full form of Amazon ECS is Amazon Elastic Container Service. Amazon ECS is highly scalable, fast, container management service that is easy to manage containers. Question: What are Feature of ECS? Amazon ECS is a regional service that running application containers in a highly available manner across multiple Availability Zones within a region. You can create Amazon ECS clusters within a new or existing VPC. Amazon Lambda is web service that runs code in response to events and automatically manages the compute resources required by that code. Question: What Is Amazon Batch? Amazon Batch enables you to run batch computing workloads on the Amazon Cloud. Batch computing is a common way for engineers to manage large amounts of compute resources. Question: What are components of Amazon Batch? 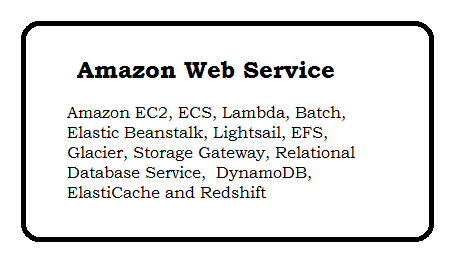 Question: What is Amazon Elastic Beanstalk? It is Service which can quickly deploy and manage applications in the Amazon Cloud. Elastic Beanstalk automatically handles the details of capacity, load balancing, scaling, and application health monitoring. Elastic Beanstalk supports applications developed in Java, PHP, .NET, Node.js, Python, and Ruby etc. Question: What is Amazon Lightsail? Lightsail is designed to be the easiest way to launch and manage a virtual private server (VPS). Question: What is Amazon S3? Full form of S3 is Amazon Simple Storage Service. Amazon S3 is a web service which provides storage Service through web services interfaces. Question: What is Amazon EFS? Full form of Amazon EFS is Amazon Elastic File System. EFS provides simple, scalable file storage for use with Amazon EC2 instances. Question: What is Amazon Glacier? Amazon Glacier is an online file storage web service that provides storage for data archiving and backup. Question: What is Amazon Storage Gateway? Amazon Storage Gateway is a service that connects an on-premises software appliance with cloud-based storage to provide seamless and secure integration in the cloud. Question: What is Relational Database Service? Question: What is AWS DynamoDB? Question: What is AWS ElastiCache? ElastiCache is a web service that makes it easy to set up, manage, and scale a distributed in-memory data store in the cloud. Redshift is Web service which offers fast query performance using the same SQL-based tools and business intelligence applications. Question: What is Elastic IP addresses in aws? An Elastic IP address is a static IPv4 address designed for dynamic cloud computing. An Elastic IP address is associated with your AWS account. With an Elastic IP address, you can mask the failure of an instance by rapidly remapping the address to another instance in your account. Internet Protocol Version 4 (IPv4) is the fourth revision of the Internet Protocol and a widely used protocol in data communication over different kinds of networks. Question: What is difference between IPv4 and IPv6? Question: What is EC2 instance in aws? An EC2 instance is a virtual server in Amazon's Elastic Compute Cloud (EC2) for running applications on the Amazon Web Services (AWS) infrastructure. Question: What is volume in aws? An Amazon EBS volume is a durable, block-level storage device that you can attach to a single EC2 instance. You can use EBS volumes as primary storage for data that requires frequent updates, such as the system drive for an instance or storage for a database application. Question: What is Amazon EC2 Dedicated Hosts? An Amazon EC2 Dedicated Host is a physical server with EC2 instance capacity fully dedicated to your use. Dedicated Hosts can help you address compliance requirements and reduce costs by allowing you to use your existing server-bound software licenses. Question: What is EBS Snapshots? We back up the data on Amazon EBS volumes to Amazon S3 by taking point-in-time snapshots. Snapshots are incremental backups, which means that only the blocks on the device that have changed after your most recent snapshot are saved. Elastic Load Balancing distributes incoming application traffic across multiple EC2 instances, in multiple Availability Zones. The load balancer serves as a single point of contact for clients(like browser), which increases the availability of your application. Question: What Is Amazon VPC? Amazon Virtual Private Cloud (Amazon VPC) enables you to launch AWS resources into a virtual network. This virtual network closely resembles a traditional network that you'd operate in your own data center, with the benefits of using the scalable infrastructure of AWS. Question: What is security groups in aws? A security group acts as a virtual firewall that controls the traffic for one or more instances. When you launch an instance, you associate one or more security groups with the instance. You add rules to each security group that allow traffic to or from its associated instances.